When state and local governments issue municipal bonds to finance public projects, they generally must disclose to investors important information throughout the life of a bond. Municipalities make these continuing disclosures to bondholders by filing them through the Electronic Municipal Market Access (EMMA®) website operated by the Municipal Securities Rulemaking Board (MSRB). Beginning February 27, 2019, issuers of certain municipal bonds also may be required to use EMMA to disclose to investors information about significant bank loans, derivative instruments and other financial obligations, as well as events reflecting financial difficulties related to those financial obligations. These new financial obligation disclosure requirements were established under amendments to the U.S. Securities and Exchange Commission’s (SEC) Rule 15c2-12. The EMMA website will begin to accept and display these two new types of disclosures on February 27, 2019. For more information about the amendments and how to submit the new disclosures to EMMA, read the MSRB’s resource, 10 Things to Know: Disclosing Financial Obligation Information. A webinar about amended Rule 15c2-12 and the EMMA website, conducted by the MSRB with panelists from the Government Finance Officers Association (GFOA), National Association of Bond Lawyers (NABL), Bond Dealers of America (BDA) and the Securities Industry and Financial Markets Association (SIFMA), is available on-demand. In 2018, the MSRB marked the 10th anniversary of its EMMA website and for more than a decade now the EMMA website has connected investors with pertinent information about municipal issuers and their bonds. 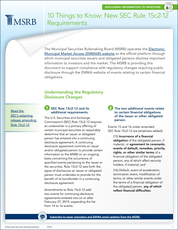 This year, the MSRB is focused on improving the EMMA experience for issuers. In 2019, the MSRB will be rolling out a more streamlined continuing disclosure submission process in EMMA Dataport, the user interface used by most issuers to meet their federal disclosure obligations. The changes to the submission process are informed by extensive engagement and focus groups with municipal market participants. 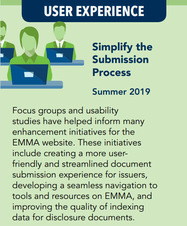 The MSRB continues to welcome feedback from issuers and others about how the EMMA website can better achieve its goal of a more transparent and efficient municipal market. Questions regarding EMMA improvements should be directed to Leah Szarek, Senior Manager, Market Transparency, at lszarek@msrb.org. In 2019 the MSRB’s Board of Directors will elect three public representatives and two regulated representatives. Applications are available on the MSRB Board of Directors Application portal and will be accepted until February 15, 2019. The Board consists of 11 members who are representatives of the public, including investors, municipal entities and other individuals not regulated by the MSRB; and 10 members from firms that are regulated by the MSRB, including representatives of broker-dealers, bank dealers and municipal advisors. The Board is divided into four classes whose members serve staggered, four-year terms beginning October 1 in the year elected. This year, the MSRB is particularly interested in, with respect to the public member positions, individuals employed by frequent issuers and individual investors or those who invest on their behalf. 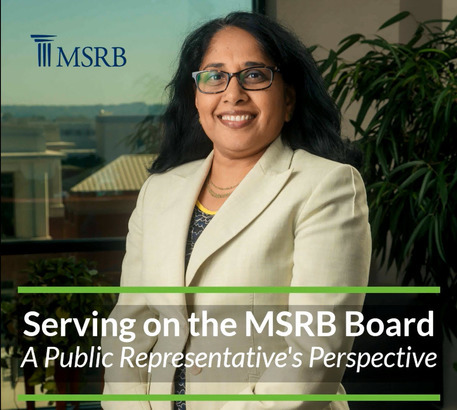 MSRB Rule A-3 outlines requirements for all applicants to the Board, including specific eligibility requirements to serve as a public or regulated Board member. Public representative candidates must meet the recently revised public independence standards. Qualified candidates, representative of the municipal market’s gender and minority diversity, are encouraged to apply. Hear what Lakshmi Kommi, Director of Debt Management in San Diego and a MSRB Public Representative, finds fulfilling about her role. Board members Richard Ellis and Manju Ganeriwala will be participating in the 2019 National Association of State Treasurers Legislative Conference in Washington, DC, on February 10–12, 2019. View a full list of 2019 Board member outreach. This year, the Board is also taking the opportunity at several of its quarterly meetings to meet with groups representing entities regulated by the MSRB—dealers and municipal advisors—and those whose mission it is for the MSRB to protect—investors, municipal entities and obligated persons. Listen to Chair Hall discuss how the MSRB is prioritizing stakeholder engagement in 2019. EMMA® enables issuers to enhance the display of their municipal securities information. 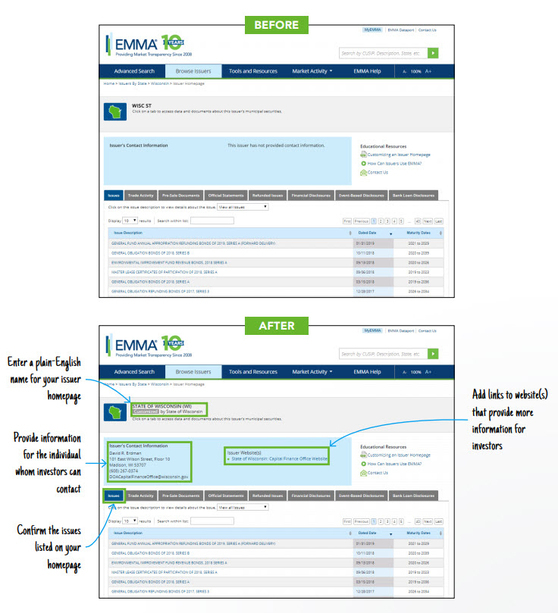 Creating a free custom EMMA issuer homepage helps issuers communicate more effectively with investors and monitor information about their bond issues. The MSRB has created a step by step guide for the customization process. Should you need additional assistance, the MSRB also offers free personal phone appointments and webinars. Contact MSRB Support to schedule an appointment or provide feedback.